Buying used or second-hand pallet racking is an affordable option when you need to install, repair or add to your current pallet racking systems. We have a large volume of stock on hand including, Dexion (Speedlock, MK3, MK6), Novalok, Victor, Capital Victor, Capital Dexion, and Acrow Series 80 & 88 product. Pallet Racking Solutions has the largest range of used and second-hand stock available and all in great condition. Everything we stock has passed our rigorous inspection process, giving you peace of mind when it comes to safety and quality. Whatever style of frames and beams you need, in any size and quantity, we’ll be able to supply. We also hold a large stock of used / second-hand MDF (for shelving) and Triboard (for raised storage platform), pallet support bars, shelf supports, and wire mesh. If you need help with installation we have a nationwide team of 25 staff to complete this process. For your peace of mind, we invite you to view our selection of used / second-hand racking at our warehouse before you buy, or get in touch to find out what we have in stock. Do you have Surplus Racking? If you’ve got surplus racking we can turn it into cash. We will gladly make a site visit to assess the value of your product. Our team can disassemble your pallet racking and relocate it to a new site. 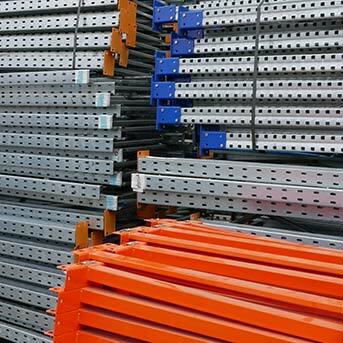 We can then help you out with any additional racking you might require. We also purchase Material Handling Equipment that is surplus to your requirements.